* PLX BB 18R (Reverb); replaces the EZ81 rectifier tube with a GZ34 tube and adds one ECL82/6BM8 tube. Tolex: Black Levant is standard, other colors available. Note: Dimensions are approximate and do not include the cabinet feet and handle heights. Tube Driven Spring Reverb (PLX BB 18R). 18/9 watt half power switch (B+ voltage switch). Covering: We offer many tolex color options. Please contact us for details. Remote Tremolo & Reverb On/Off Footswitch. International AC Input Voltages. Standard is 120VAC. 18/9 watt, half power switch (B+ voltage switch). 1x12, 2x10 and 2x12 configurations. Covering: Lacquered tweed and a variety of tolex colors. Please contact us for details. Speaker Options: Eminence, Jensen, Celestion, and other brands. Please contact us for details. 1 x 12 Extension Cabinet with your choice of speakers. The extension cabinet allows the user to configure the cabinet as 1/3 open back, 2/3 open back, or closed back. The extension cabinet adds more depth to the tone, more stage coverage and more bass response when used in the closed back configuration. The 1 x12 Combo can be stacked on top of the 1 x 12 Extension Cabinet. 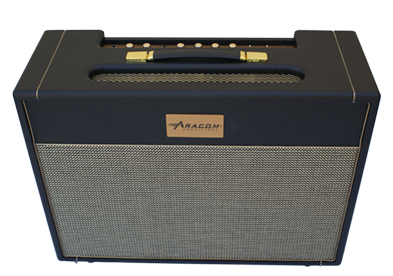 Contact ARACOM for additional colors. While the original 1967 Marshall 18w Tremolo amplifier did not offer much clean headroom, we’ve designed the Tremolo channel on our PLX BB 18 to have a bit more. Of course the clean headroom will not be as much as a 50 or 100 watt amp, but it does add enough to make the amp more versatile. The guitarist can select between using the cleaner, brighter Tremolo channel or the darker dirtier Normal channel. Many guitarist like the simplicity the Tremolo channel’s single tone control knob to dial in the tone. When cranked up, this channel provides an awesome overdriven tone, while not being too oversaturated. This provides a nice distorted tone, while still offering great note and pick attack definition. The natural sounding tube driven Tremolo effect has Intensity and Speed controls. This effect can be turned on or off via remote footswitch pedal or by the master Tremolo on/off toggle switch, located on the back of the amp. High and Low input jacks are provided, which allows the guitarist to control the amount of the guitar’s signal level driving the first preamp stage. The Low input jack cuts the guitar’s pickup signal by 3db. The Tremolo channel is very versatile providing impressive touch sensitivity and a wide range of tones, especially when controlled by the guitar’s volume control. The Tremolo channel is perfect for a wide spectrum of tones from jazz, grinding blues, classic rock and modern rock. Plug into the Normal channel, crank it up, and you will hear the awesome singing overdriven tone these amps are known for. The Normal channel is the darker and hotter channel. It provides great saturation and overdriven tone. Perfect for leads and playing heavy rhythm sections. Like the Tremolo channel, the Normal channel also has High and Low input jacks; however the Normal channel preamp circuit is configured different than the Tremolo channel. The High input jack on the Normal channel adds a second preamp stage in parallel with the Lo Input’s single preamp stage. The paralleled preamp stages allow the power amp tubes to be driven harder, providing an awesome overdriven tone. For less overdrive and more Blues grind the Low input jack can be used. Like the Tremolo channel, the Normal channel has a single Tone knob that dials in the tone. The PLX BB 18R includes Tube Driven Spring Reverb, along with the PLX BB 18 features. Available in Head and Combo configurations. While it is rare to find an original Marshall 18 watt amplifier from the 60s with Reverb, the PLX BB 18R includes a tube driven spring Reverb effect. The Reverb sets PLX BB 18R amplifier apart from other non Reverb 18 watt amps. Nothing beats the natural tone of an actual tube driven, mechanical reverb circuit and the PLX BB18 sounds amazing with the added reverb option. The Reverb effect is provided on the Tremolo channel and can be used simultaneously with the Tremolo effect. A single volume knob controls the Reverb intensity. The Reverb and Tremolo can be turned on and off via a remote footswitch pedal. The optional Reverb feature adds even more versatility to the PLX BB 18 combo amp. Note: the PLX BB18 and PLX BB 18R are equipped with tube rectifiers, which provides the "sag" effect that many sophisticated guitarists seek in a vintage style tube amplifier.